This is what I call a “thickie”. It’s so dense you may need to eat with a spoon…right from your blender. Rich, creamy, chocolaty, nutritious – what else can you ask for? Nutrient Absorption: Studies have shown the improved absorption of certain nutrients when consumed with avocados. I also like to include avocado in my salads for this same reason, and because they taste great. Heart Healthy: The folate and unsaturated fat in avocados contribute to a healthy heart. The primary fatty acid in avocados, oleic acid, in conjunction with alpha-linolenic acid (ALA) have been shown to improve heart health. Anti-Inflammatory Action: Several nutrients in avocados help to reduce inflammation throughout the body. For those suffering from arthritis, in particular osteoarthritis and rheumatoid arthritis, regular consumption of avocados can offer relief. Anti-Cancer: Preliminary studies have shown the ability to help prevent cancers in the mouth, skin, and prostate, likely due to the combination of anti-inflammatory nutrients and antioxidants. Eye Health: Look no further than the carotenoids for this health benefit. Blood Sugar Regulation: The carbohydrate profile doesn’t lead to spikes in blood sugar levels. Reduced Cholesterol: Nutrients in avocados have been shown to help lower cholesterol. This is a well rounded meal replacement smoothie. I had it for breakfast and was satiated until lunch. This smoothie was so tasty I made it again the next day with raw milk instead of kefir and it was just as good. Enjoy! 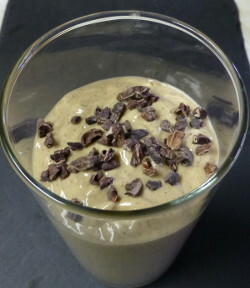 I’d love to know if you try this chocolate almond avocado smoothie and what you thought. Please leave a comment below. Happy Blending! Wasn’t sure about this combo but I was amazed how tasty it was – add ons were ice cubes, chia and spinach. Used a high quality cocoa powder instead of nibs, though. Put all of it in a quart “Ball or Kerr” glass jar (the rounded top keeps everything in the jar). Use a stick blender right in the jar. This is my breakfast and lunch along with a handful of mixed nuts to eat at the same time. Also know how to keep both avocados and bananas from ripening too quickly. I buy them at Sams Club in bulk, if you are interested. Your smoothie looks delicious, Denis. I haven’t used a stick (immersion) blender to make a smoothie. Will have to give it a whirl. How do you keep avocados and bananas from ripening too quickly? I am fairly new to making healthy smoothies using a variety of healthy ingredients. Your website includes calorie and nutrition information which I appreciate but haven’t seen on other websites. I’d really like to try this recipe, but some of these smoothie recipes have fairly high calorie totals. Should I be concerned about this if I am trying to watch my weight as a 51 year old female? Also, I understand avocado to be a “healthy fat”, but I am concerned that there are 31 fat grams in this recipe.Thank you for your time. Just trying to sort through so much new information as I learn what works best for me. That said, listen to your body. Maybe you don’t require as many calories or fat depending on your lifestyle. You want feel satiated after your smoothie and not need a snack before your next meal.